At my IIT (BHU) lecture (see also previous post), I emphasized Bertrand Russell’s remark that there is neither meaning nor truth in (formal) mathematics. Hence, any nonsense proposition one desires (such as “All rabbits have two horns”) can be proved as a formal mathematical theorem from appropriate postulates: Russell’s sole criterion being that the postulates should be “amusing”. Theorem: A differentiable function must be continuous. (Therefore, a discontinuous function cannot be differentiated.). I have made exactly this point earlier in this blog. The question is which definition of the derivative should one use for the differential equations of physics? As pointed out in Cultural Foundations of Mathematics (or see this paper) the issue can only be decided empirically, unless the aim, like that of Stephen Hawking and G. F. R. Ellis, is to spread Christian superstitions about creation using bad mathematics. Superstitions go naturally with ignorance. One such ignorant professor from the IIT mathematics department was present during my lecture. His knowledge was limited to the first of the theorems above, and he ignorantly believed that it was some kind of absolute truth, which everyone was obliged to believe. He objected to my claim that a discontinuous function can, of course, be differentiated, and walked out to show his contempt of my claim. Even the students had heard of the Dirac δ, and agreed with me. The next day during the workshop, I explained that I had engaged with this question since my PhD thesis. But the professor remained absent, though his ignorance was exposed before the students. He is welcome to respond by email; I will post it publicly since it is sure to further expose his ignorance. Oliver Heaviside applied first applied this to problems of electrical engineering over a century ago, and Dirac, formerly an electrical engineer, then applied the Dirac δ to physics. It remains very useful because it is the Fourier transform of white noise (flat spectrum or the unit function), and used even in the formal mathematical theory of Brownian motion. Will be giving the institute lecture at IIT (BHU), the century old first engineering college in India, on the 18th of Jan, followed by a workshop on “Alternative math” on 19th of Jan. Core question: Indians are proud of our ganita tradition, but today we teach Western formal math believing it to be superior; but what if Indian ganita were superior? Outline answer: (1) The West was backward in math. It imported most basic math from India, including arithmetic, algebra, trigonometry (via Arabs) and calculus and probability (directly from Cochin). (2) This import created a crisis because practical ganita differed philosophically from religious Western math. To fit it into their framework, the West changed ganita to mathematics by adding religiously-loaded metaphysics. (3) During colonialism, our own ganita wrapped in religiously biased metaphysics and packaged with a false history was returned to us and declared superior. We never cross-checked either that fraud history against evidence or that superstitious Western claim of superiority against commonsense by critically comparing formal math with ganita (normal math) to decide which is really superior. (4) Eliminating the religious/metaphysical elements (a metaphysics of eternity/infinity) in formal math does NOT affect practical value which all comes from normal math. (5) Instead it makes math easy hence enables students to solve harder problems. It also results in better science. Further details about the lecture and workshop are posted at http://ckraju.net/IIT-BHU/. Explicit links below. Alternative math 2: Calculus without limits. Yesterday (26 November, Constitution Day) at Constitution club, I received the Nilakantha honor from the Dalit organization “Kabir ke log” from a former Union deputy education minister (and scholar) Dr Sanjay Paswan). Click for a related article on dalit scientific achievements, in Jansatta. 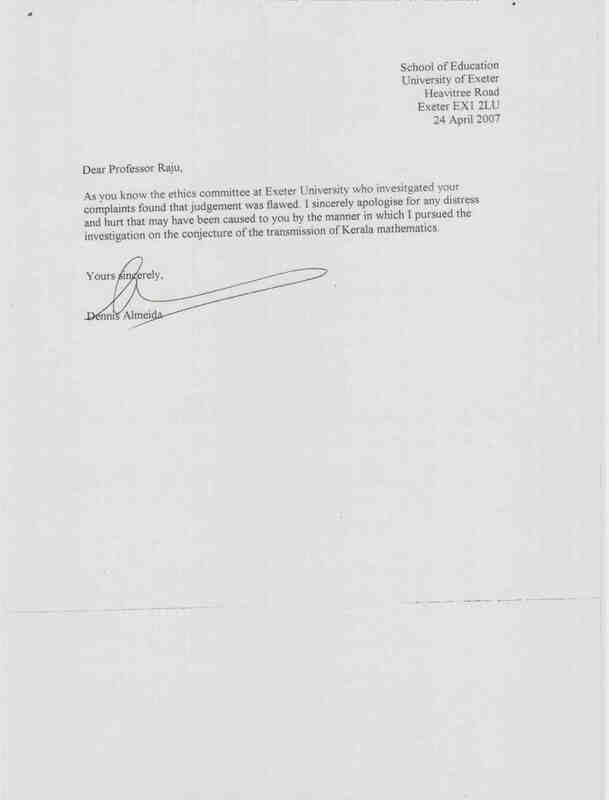 Click for a related article on Indian mathematics. Still earlier, this year, I received the MP Ratna award from the MP Chief Minister. 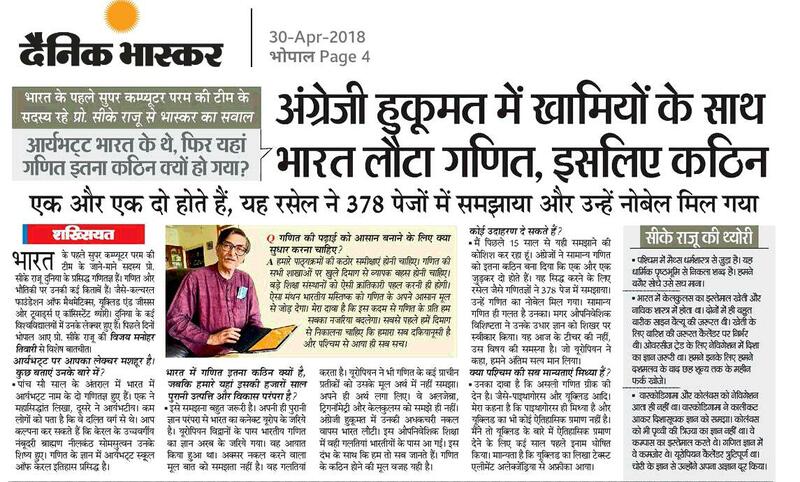 Click for a related interview on math education in Dainik Bhaskar. You are currently browsing the archives for the History and Philosophy of Mathematics category.